My grandma’s silver champagne bucket; this was a homework assignment. Still kicking myself for not getting an actual bottle of champagne. I would’ve enjoyed sharing it with Grandma. When I was in college, even though I was majoring in animation (yeah, that changed), a still-life painting class was a required course in my first year. It met once a week for six hours and before it even started, I dreaded it. I loved painting landscapes, but I’d never painted a bowl of fruit or a vase of flowers. The idea seemed daunting to my twenty-something self and I had zero interest in a subject matter that I considered boring. Little did I know that still-life painting class would turn out to be one of my favorite classes ever. Not only did I learn more about what makes good composition and how to use light and color in different ways, but I also learned how to paint reflective surfaces, how to paint transparent glass, how to paint folds in fabric, and how to really handle oil paints (I’d only ever painted with acrylics). But mostly, it was just a fun class. We’d crank up some music (usually Pink Floyd or Bjork) and just paint. That class became a source of stress-relief when other classes, a long commute, and work had me frazzled and feeling overwhelmed. My second or third attempt at painting wine glasses. I loved how they turned out but didn’t love the pink fabric. I’m pretty sure this painting is sitting in a box somewhere in my house. A couple of canvases went to my grandma (whom I lived with when finishing college and would often call dibs on canvases before I was even finished with them), one painting of fruit and a silver kettle went to my future-mother-in-law (I should take a photo of it), and I even managed to sell two 5x7 canvases from my job at a picture framing store. One of the 5x7 paintings I actually sold, eggplant, Bosch pear, and grapes in an extravagant frame. Sometimes it was fun to get to play with scrap pieces of moulding. 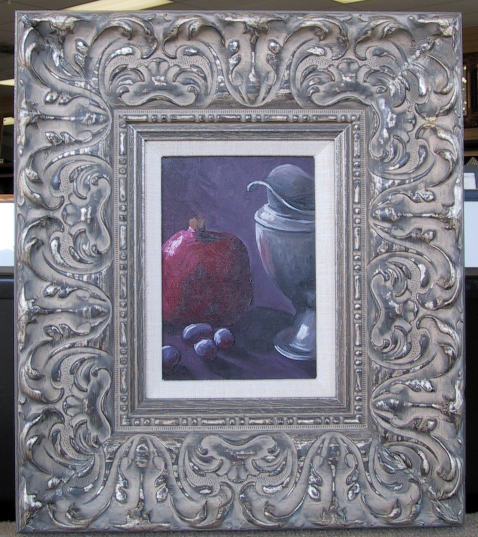 The other little canvas I sold, this one was my favorite with the little silver pitcher and pomegranate. I’m a little sad I don’t have them anymore, or at least have a higher quality photo, but I needed the money at the time. Quite a few canvases were garbage too and I will eventually paint over them, or let my son paint over them. But this painting was my favorite with the copper kettle and brass bowl. It currently sits on my dresser and though I don’t love the frame, looking at it brings me back to that still-life class and the peace it brought me each week. It’s been probably fifteen years since I painted with oils and the idea of starting up again with small children just seemed daunting. My 3rd grader has recently shown some interest, so I ordered some student-grade oil paints. Thankfully, I have a few unfinished canvases that we can doodle on and we’ll see what sparks us to put on canvas. We don’t do much to celebrate Valentine’s Day in our family. It’s just not a holiday we celebrate; even back when my husband and I were dating. With our boys in school now, Valentine’s Day is back on our radar and every year I fully expect my boys to want store-bought, character valentines. It’s been a few years now and they’ve surprised me with wanting something custom-made by their mom. I’m not sure whether to feel used or that I set myself up for it. The year my oldest was in kindergarten, we missed his party because he only attended school three days a week, and the Valentine’s Day party fell on a day he didn’t attend. I thought I was off the hook with valentines until he went back to school after the weekend and a box of Valentines and treats was waiting for him from his classmates. I felt like a stellar parent. The next year I knew he would have been happy with character Valentines from Target, but I wanted to do something fun and non-edible since there were a couple of kids in his class with scary allergies. We already had a bunch of bacon bandaids, so I made this little card and printed them onto card stock, then added the bandaid with double-sided tape. The following year, my oldest set his expectations high with something fun again and considering the sheer amount of candy he got the year before, I wanted to try and avoid food again. So we went with hand warmers! I took his photo and played with it in an iPhone app called PicsArt. Then I added the background and text in Adobe Illustrator. We stuffed the card and a hand warmer into a some 4-bar envelopes I had left over from a baby shower and done! Last year (2018), both kids were now in school and my oldest wanted to use PicsArt again to make some fun photos. I asked both boys to put on a red shirt and they chose the same Manchester United jersey. Then we made their cards with PicsArt, a little Illustrator, and we taped mechanical pencils and Dove chocolate hearts to their cards. This year, I was feeling very meh about Valentine’s Day and was all set to hit up Walmart and see what boxed valentines they had left 3 days before their school parties. Then my oldest asked what fun Valentines we were going to make this year and if we could go look on Pinterest for ideas. I couldn’t say no. We searched for non-candy valentines and saw a couple of baggies of Goldfish crackers with a fun, fishing-themed greeting. That was the winner! My boys (especially my oldest) are WAY into fishing right now. We already had a box of Ziplock snack-size baggies that we weren’t using much (they’re so small! ), so we bought a few big boxes of Goldfish Crackers filled enough for both classes. Then I took photos of each of my kids in good light and re-drew them in Adobe Illustrator, added the cartoon-y fisherman bodies, a less-then-thrilled fish, and Voile! The “Hooked on You” graphic is on one side and the “Fishing you…” graphic is on the other. The only difference is the names and different heads, of course. I saved some time (because I created these 2 days before the parties) and had everything printed onto 8.5x11 card stock at my local Office Depot. I trimmed the pages, scored, and then stapled them onto the baggies that my boys filled. 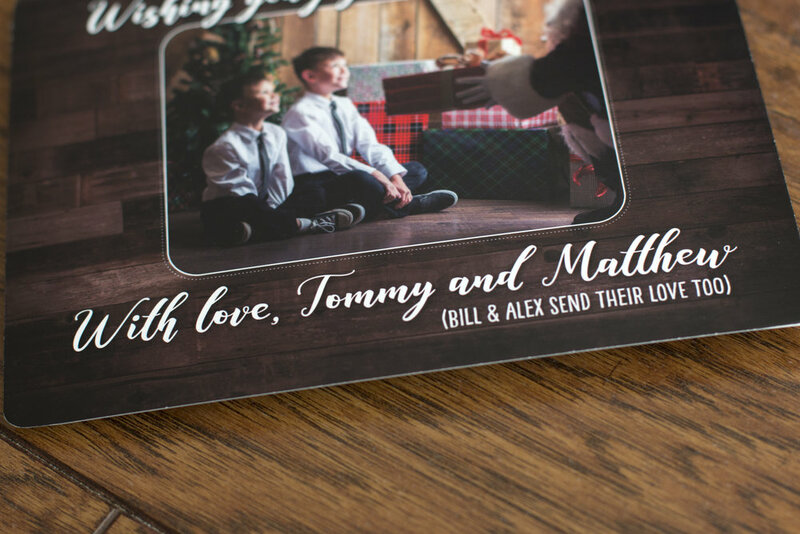 I really love how they turned out…. so much that I may add them to my Etsy shop next year that others can customize. I know there are only a few years where we’ll get to make Valentines for school. I’m pretty sure they stop around middle school. Whether you celebrate or not, have a Happy Valentine’s Day! 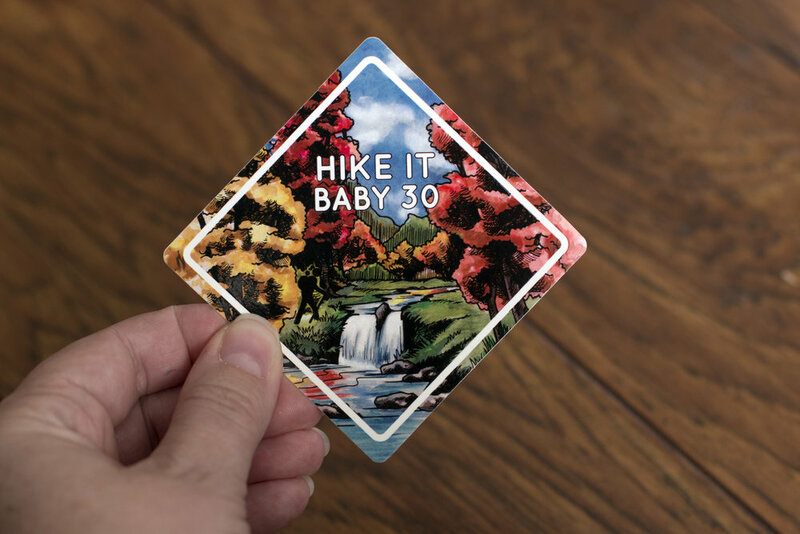 I started doing design work for Hike it Baby a little more than a year ago, and it’s been SO much fun to create whatever I can for them. 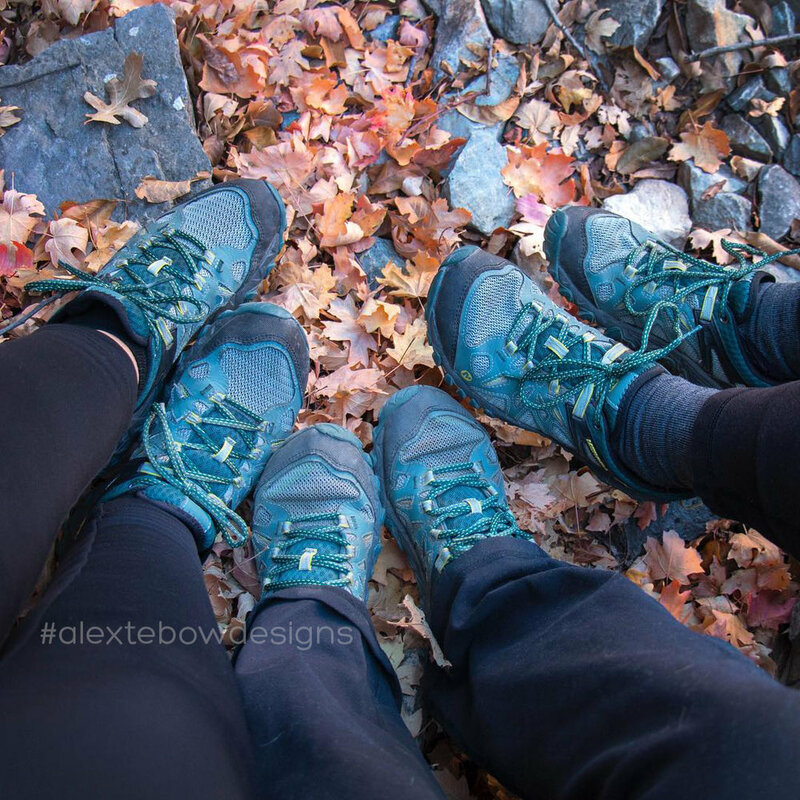 Every year they host hiking challenges that encourage families to get outside with their kids. 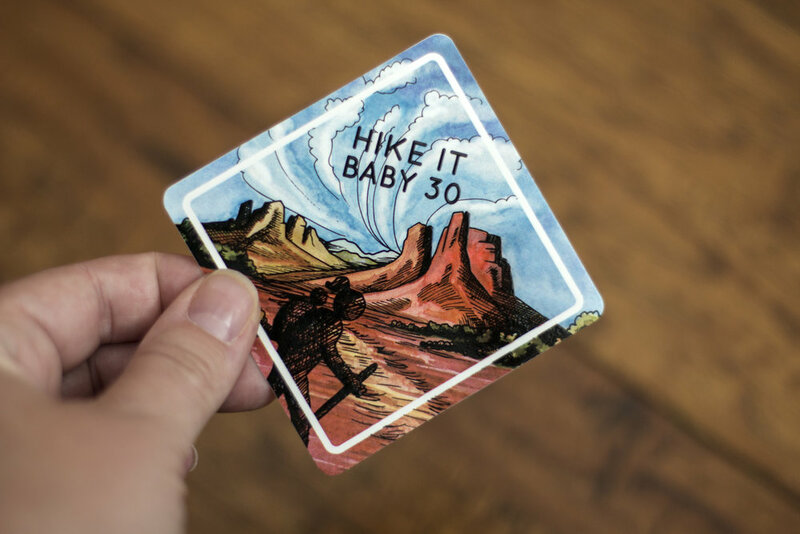 Up until 2018, they had quarterly challenges in January, April, September, and November, and the goal is to hike 30 miles in 30 days or spend 30 minutes outside three times each week. 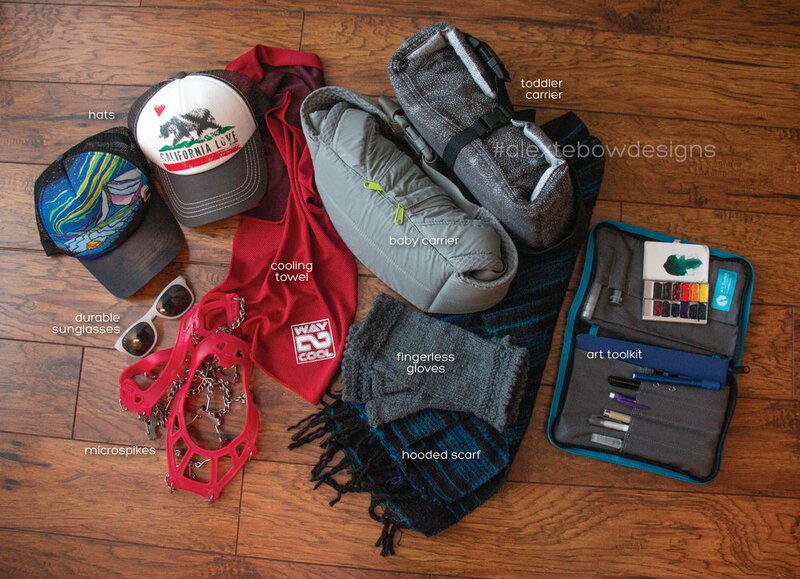 Participants can log their miles or time on the Hike it Baby website, they’re entered into drawings to win awesome prizes from sponsors, and they get to join in a Facebook group solely for participants of each challenge where we share photos from our hikes and encourage each other to keep getting outside. We get to see some pretty epic photos from hikes in the Rockies, the Appalachians, the Oregon coast, the mountains in Alaska, and even some great hikes in Japan. It’s an inspiring group to be a part of for those 30 days. 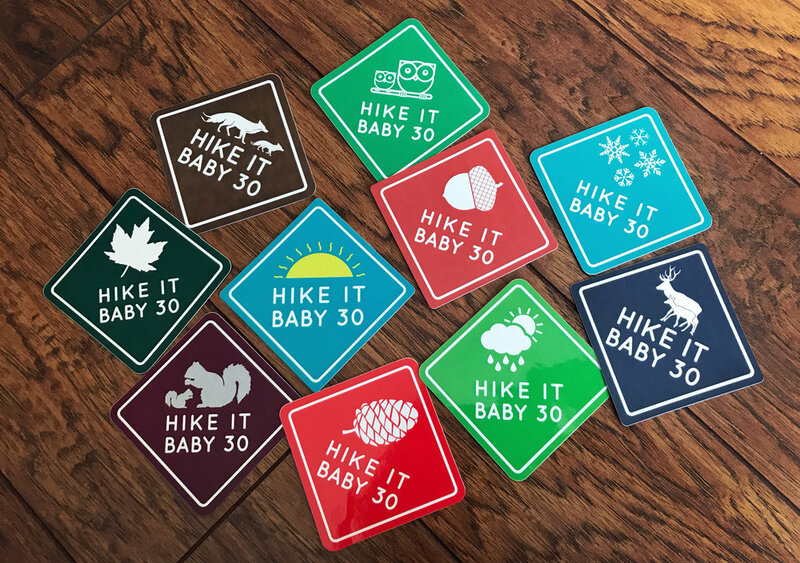 Everyone who registers for a Hike it Baby 30 challenge also gets a sticker to commemorate. In the past stickers have always been a solid color with a fun little graphic. The color and design is different each challenge and participants love to collect them. I had the privilege of designing two of them from 2017; the brown sticker with the foxes and the navy blue sticker with the buck and fawn. 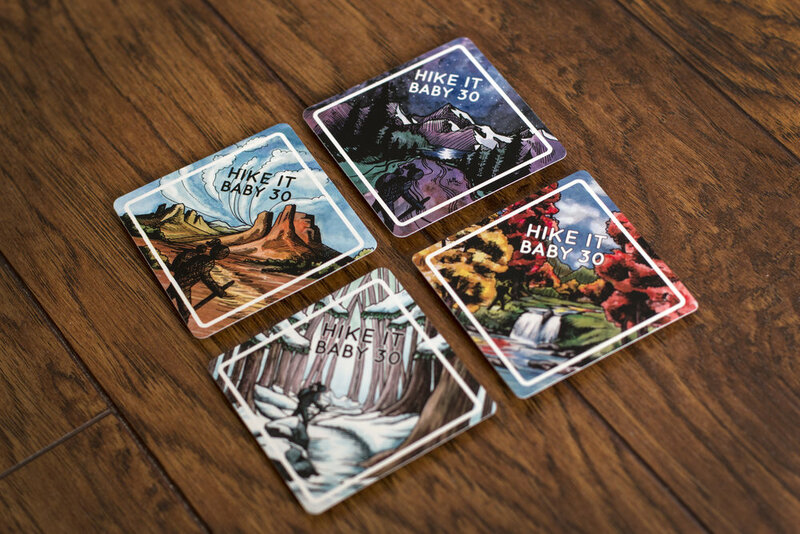 For 2018, the folks at Hike it Baby decided to up the ante on the Hike it Baby 30 stickers and they asked me to do a landscape watercolor painting for the four challenges; each representing the season and a different landscape in the Hike it Baby world. I was so pleased with how these turned out in sticker form. Three of these designs made for great t-shirt designs too. More than a few people have joked that we can’t possibly go back to the older style anymore, so we’re brainstorming ideas for 2019. We shall see how it turns out! With another year, came another fun holiday card for my family. Every year for the last 6 years we’ve had Santa photos taken with FotoFly, and it’s become a fun, family tradition. I make a point to schedule the photos right before Thanksgiving so I have time to design a card! My boys love to dress in the same outfit and they now give input on how they want to pose with Santa too. This year, my 9yo had the idea for his brother and him to wear their “wedding clothes” and sunglasses and pretend to be Santa’s bodyguards. I thought it was a cute idea and we went with it. Of course, the night of the shoot I completely forgot the suit jacket for my youngest (In my defense, I was suffering from a nasty head cold). Even without the jackets, the photos turned out cute. I have to give a shoutout to my friend Amanda for coming up with the fantastic words for the front of our card. That part is always the hardest for me! I had these printed with Overnight Prints. They turned out great and were very affordable. When it was time to mail them, I really like to get colored envelopes, so I picked some up from my local Paper Source in their Clover color. I would have preferred a shade of red, but they didn’t have enough on the day I went. I should have thought of that ahead of time and ordered from their website. Relax, that’s not really the Wiselka Family’s address. I printed names and addresses onto the envelopes using the same fonts I used on the card. My trusty HP laser printer, that I’m sure is more than 10 years old, but it still does a great job. 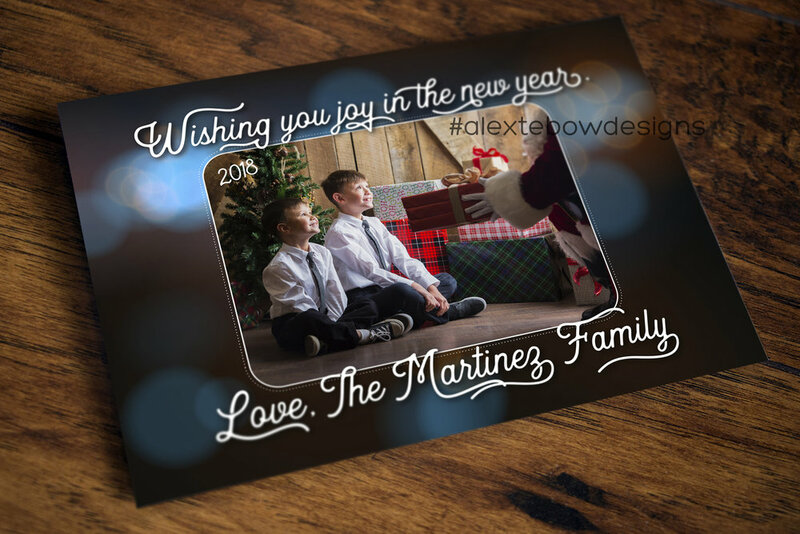 I don’t get to do much design work for my own family, so our annual holiday card is one thing I really look forward to designing every year. I think my kids love getting to add their input too. Holiday cards are up in my Etsy shop and will be available until December 14, 2018. 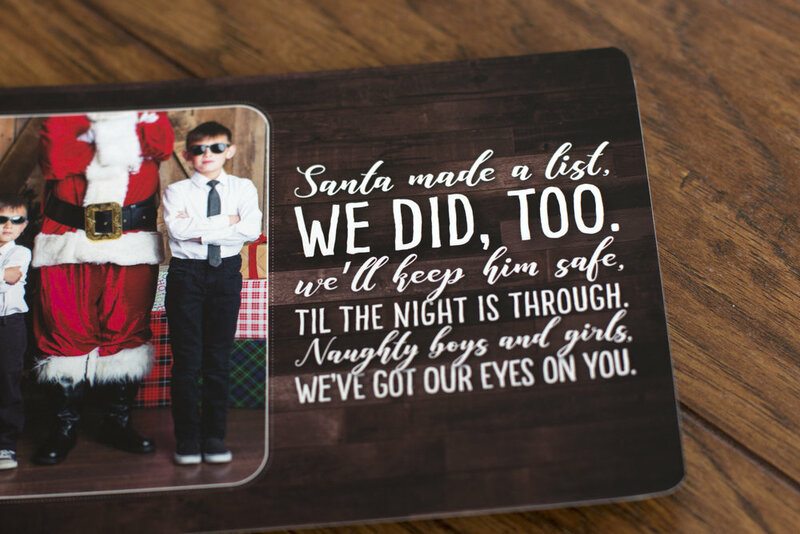 If you don’t have any Etsy account or would prefer to place an order outside of Etsy, you’re welcome to send me an email and I’ll get your holiday card made. Here are some of the designs I added this year. Click on the images below to link to the listings on Etsy. These two designs also have the option to showcase one portrait photo instead of two landscape. This one below can be done with either a blue, red, or green background. I also added our holiday card from last year. You can choose between a green, red, or blue faux knitted sweater background. I added two background variations to my popular Santa’s Most Wanted holiday card. The design below is a variation on the Santa’s Most Wanted Card that I created for a client a couple of years ago. This one really cracked me up! Through the listing you can choose from three different chalkboard background colors: red, green, or blue. Last year I created this fun Hanukkah-themed cootie catcher. My youngest loved figuring out how to make it work. Today through Monday, December 10th, it’s just $1.00 in my Etsy shop. After purchasing you just download the file and print as many as you need. The file is sized to print on 8.5x11 paper and folding instructions are included… you know, in case it’s been while since you’ve folded one! If you live where A4 paper is the norm, shoot me an email and I’ll be happy to send you the file at that size. ·Keep your head high and watch birds soar, keep your head low and find four-leaf clovers. ·Let your heart make decisions, it does not get as confused as your head. ·Dream lofty dreams, and as you dream, so shall you become. ·Sun always shines after a downpour. ·You will see something today that will make your heart shine. ·Today is the day to show someone you care. ·Happiness is hidden everywhere, you just have to look for it. ·Your life will be healthy and harmonious. 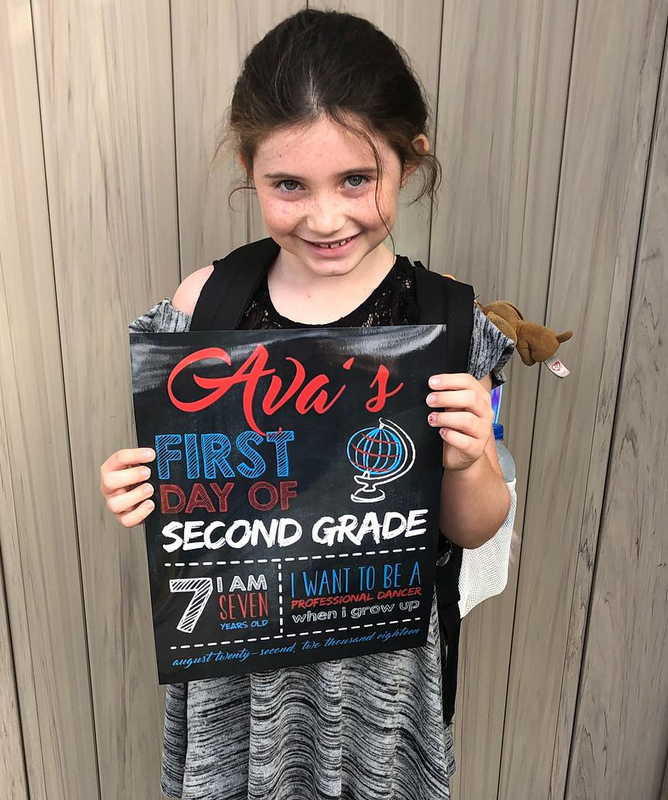 I was thrilled to get to create a bunch of First Day of School signs for so many awesome kids this year. First Day of School signs are available in my Etsy shop in the summer months through the end of September. They also can be ordered by sending me an email if you’d prefer to not go through Etsy. I customize the text using your child’s information and their favorite colors. Then you print the sign yourself. Here are my two boys this year. I wonder how many years they’ll let me keep doing this?? There will be three different font styles to choose from when they are available. The backgrounds look like a faux chalkboard and they’re set to print on 8.5x11 paper. If you want it to look more like an actual chalkboard, you can trim off the white edge and/or print onto thicker card stock. Or your can back it with a piece of cardboard. The colors print most vibrant on glossy paper, but then you have a potential glare when taking a photo. It looks more like a real chalkboard when printed on matte paper. The choice is yours. If you live in a country where A4 paper is the norm, just let me know and I can send it at that size.